According to Anandabazar Patrika and Gadgets 360 news JioPhone will be single SIM 4G mobile with VOLTE. 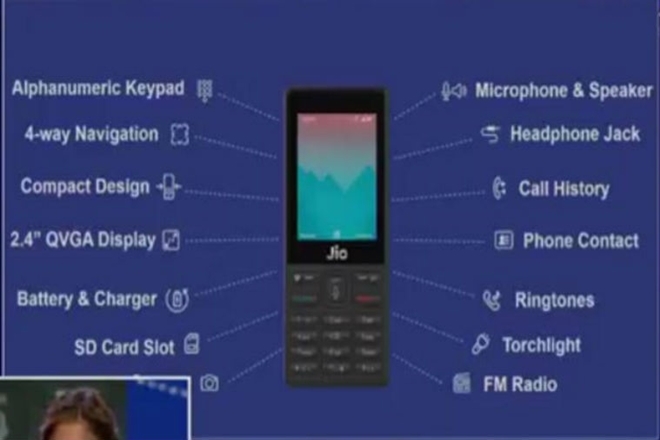 It will support JioPhone TV cable to connect the phone to TV. Also support NFC for digital payments. It has Web browser, Facebook and PM Modi’s Mann Ki Baat broadcast during the unveiling at the Reliance AGM. “At the moment’’ the phone does not support WhatsApp. Only JIO SIM cards will work on the phone. JIO phone booking for the public release start on August 24 and it will be available to buyers on first-come-first-serve basis.